By Blender Guru, to put on your wall! 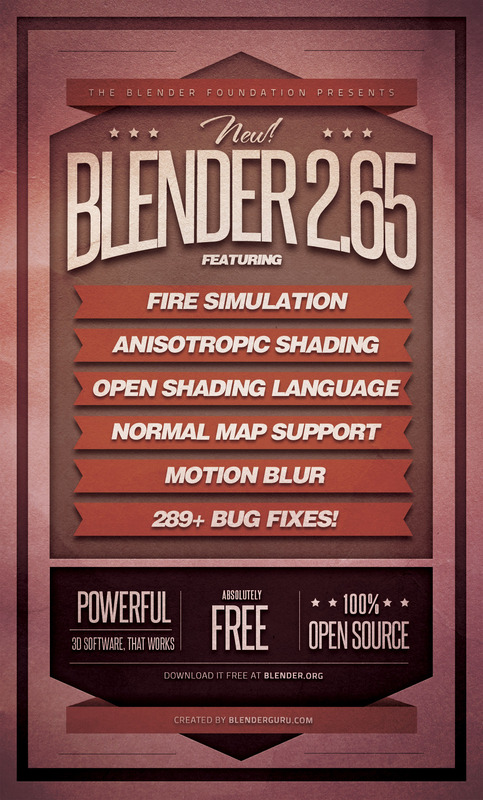 Since I'm sure you're aware that Blender 2.65 is now out, I thought you may want to include this picture I made for the announcement. Very nice. I would like to hang it on my door. Does it include the downgrading of GPGPU support ala OpenCL on hold? All this work is phenomenal, but the big Gorilla in the room is getting OpenCL ready. 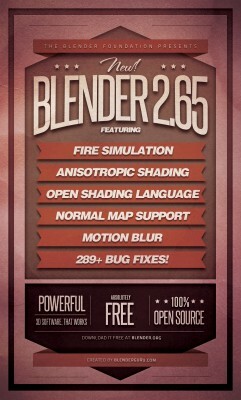 I wonder what non-blender pros think when they see this poster. As if we've never had motion blur, normal map support and anisotropic shading. It's important to mention that these are only new to cycles. @mdriftmeyer - that's AMD's driver problem, blender foundation can do nothing about it. Beautifull as always Andrew, correct me if im wrong but didnt you do the 2.65 splash screen? Or is a student from the Nature Academy. @ Greg. Luv ur 2 work boet.